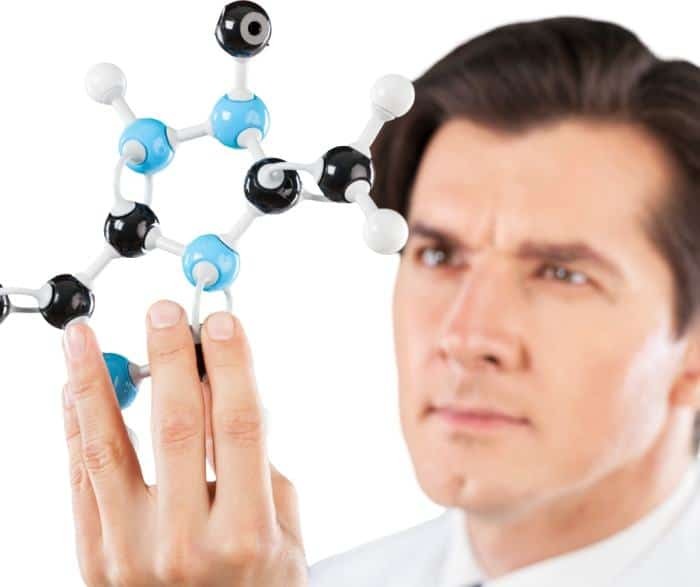 Can chitosan lower creatinine levels? What is the difference between chitin and chitosan? 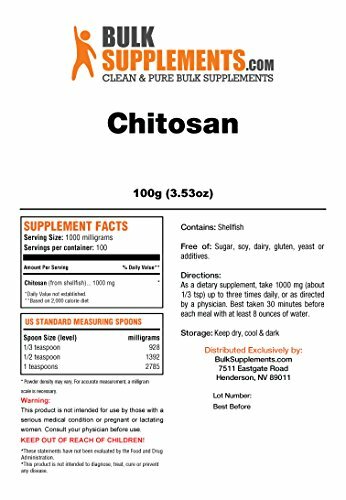 Here is a quick comparison of the top chitosan supplements in the market today. 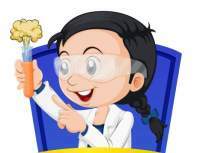 Here are the reviews of the best Chitosan Powder available in the Market today. 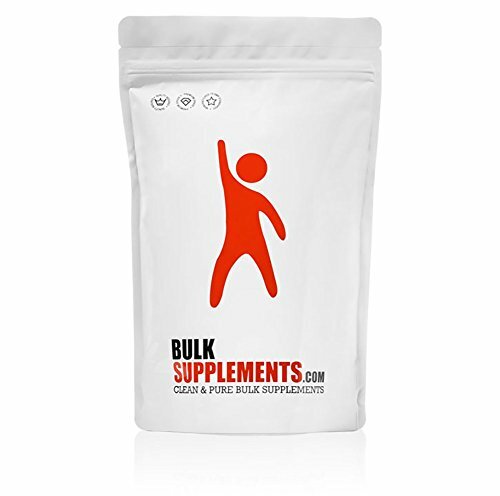 Bulk Supplements is among the most popular brands in the health supplement world. The Nevada-based company has as many as four hundred natural products sold at affordable prices. Bulk Supplements chitosan powder is clean, pure and 100-percent organic. Chitosan is a natural fiber sourced from shells of crustaceans such as crabs, lobsters, shrimps, etc. It aids healthy weight management, lowers the level of bad cholesterol while raising the level of HDL. It also prevents constipation and promotes digestive health in general. This supplement is better taken along with ascorbic acid to enhance its health benefits. It is lab-tested for purity and packaged in a resealable pouch to keep out possible contaminants. Headquartered in New Jersey, United States, Best Naturals is dedicated to manufacturing a wide range of premium-quality supplements such as vitamins, essential oils, herbal products, minerals, etc. 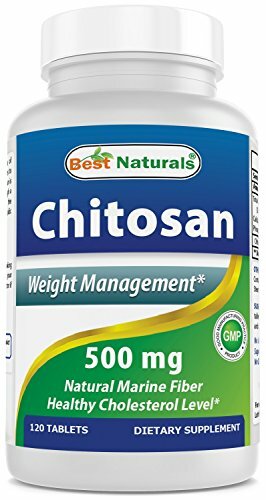 Best Naturals offers high-quality chitosan supplement in an easy-to-take tablet form. A pill supplies the body with 500mg pure chitosan, a dietary fiber obtained from crustaceans’ shells. 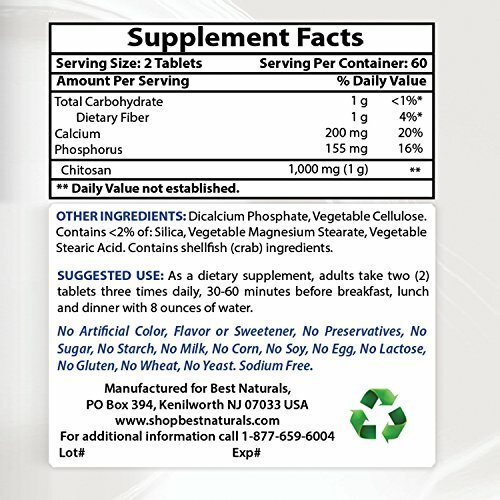 This supplement is highly prized for its unique ability to support weight loss, lower LDL (bad cholesterol) levels and support digestive health. NOW is a trusted and renowned nutrition company established in the late 1960s. The brand has a line of high-quality natural products, including protein powder, maca, probiotics, among others. One capsule of this supplement delivers 500mg of pure chitosan, a popular weight loss supplement gotten from shells of crustaceans like lobsters, crabs, etc. It contains no additional ingredients – no fillers, additives, GMOs or preservatives. Chitosan helps relieve constipation, reduces the levels of bad cholesterol, and prevents weight gain. Here are some of the key health benefits of Chitosan. The anti-inflammatory and anti-oxidative properties along with several chelating properties of chitosan may help prevent Alzheimer’s Disease (AD), Parkinson’s disease (PD), Huntington’s disease (HD), and Nerve Injury. 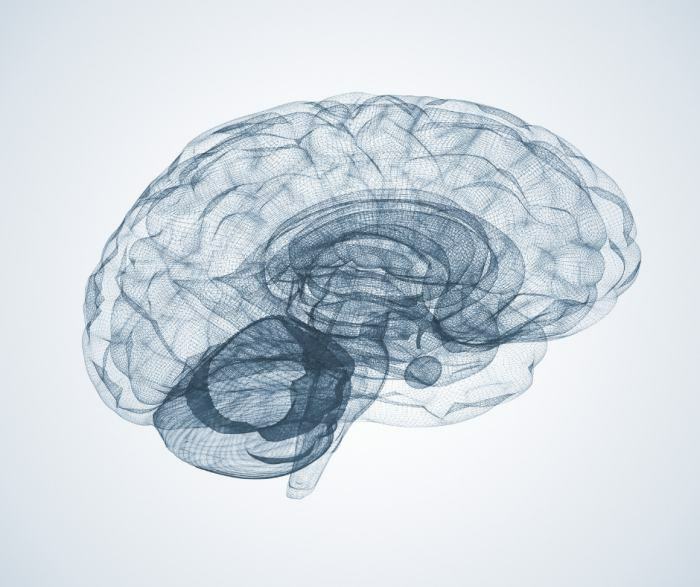 The brain is the most vulnerable organ with the restricted ability of self-repair if and when injured. Mechanisms and strategies that help protect against any brain or central nervous system injury is termed as neuroprotection system. The recent medicines or the synthetic neuroprotective agents have several side-effects and thus a natural neuroprotective drug with little to no side-effect is the need of an hour. Recently, chitosan has gained a lot of attention as an all-natural neuroprotective agent. Chitosan demonstrates a potent inhibition of the beta-amyloid cleavage enzyme (BACE-1) activity. Chitosan can restrict the growth of many multi-drug resistant pathogens including bacteria, fungi, viruses, and phages without increasing resistance. It is widely used as a wound dressing ointment to help repair the wound as well as protect against microbial infection. It is also used as a preservative in many packaged food. Infections and infestation is not only major concerns in the pharmaceutical industry but in the food industry too. There are more than 1100 studies published so far reporting the antibacterial activity of chitosan and its derivatives. It has been suggested that chitosan and its derivatives suppress viral infections and block the replication of the virulent phage in both plants and animal models. Although there are very few human trials most of them show promising results in-effect with chitosan’s antimicrobial activity. Chitosan and its derivatives have been commonly used for its tissue regenerating and wound healing properties such as in patients undergoing plastic surgery. It can interact with the skin stem cells, helping in rapid wound healing. It has many applications in the field of tissue engineering. Tissue engineering consists of reconstructing or regenerating damaged biological tissue in situations such as lesions, infections, and traumas. Chitosan and CHOS help boost collagen and hyaluronic acid production in the skin thus helps prevent scarring. Recently, chitosan is hyped as a weight loss aid. Most of the research shows that chitosan along with a low-calorie diet results in a small amount of weight loss. But taking chitosan without restricting calories intake does nothing to improve weight loss. In short, chitosan can help with weight loss in overweight and obese people only if paired with a restricted calorie diet and exercise. A 24-week long clinical with 250 participants conducted at the University of Auckland showed that although the chitosan group lost more body weight as opposed to the placebo group. Another study for the two-week period, treating eight normal weight adult males, with chitosan showed that cholesterol intake decreased from 340 to 276 mg/day. Chitosan and its derivatives are top runners as chemotherapy and radiotherapy alternatives for many drug-resistant tumors. The current age conventional anti-cancer drugs generally produce severe side effects like reducing the patients’ immunity and energy to fight against the cancer and infections. Therefore, it is important to find new, powerful anticancer agents that are highly effective but also with little to none side-effects. As discussed above chitosan can help boost the drug delivery system as well as improve the effectiveness of chemo-and radio-therapies. Most of the studies supplementing chitosan for weight loss study used dosage between 2 to 3 grams per day for a short term ranging from 7 days to 12 weeks. It is always advisable to consult with an expert or a doctor before starting these supplements or any other dietary supplements. Chitosan is considered safe for most people when taken orally or when applied to the skin for a short time. Care should be taken for those allergic to shellfish. But it is known that most people allergic to shellfish are actually allergic to it meat and not the outer shell itself, so there is some divided views regarding the same. Research shows constipation and upset stomach as possible side effects of chitosan. 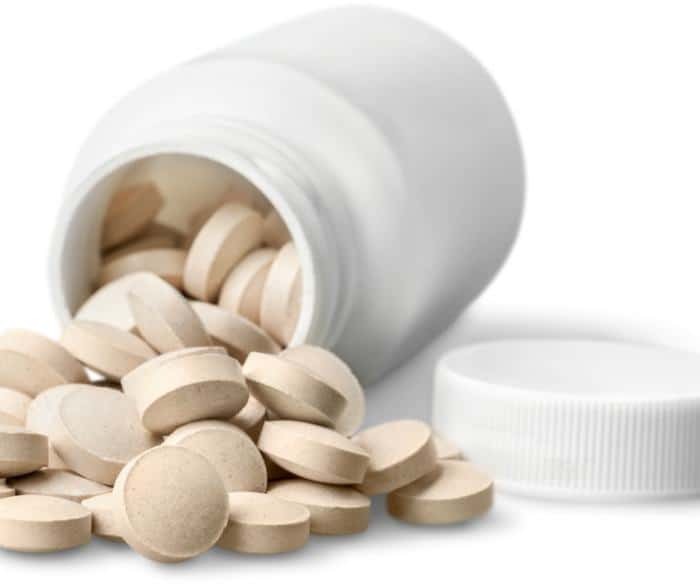 In certain cases, it may impact the absorption of calcium and vitamins A, D, E, and K.
Chitosan may interfere with blood thinners like warfarin as well as some antiviral and diabetes medications. There are some rare cases reporting of arsenic poisoning caused by long-term use of chitosan supplements. Due to a lack of research, it is advisable to restrict supplementing chitosan in children, pregnant and/or breastfeeding women. 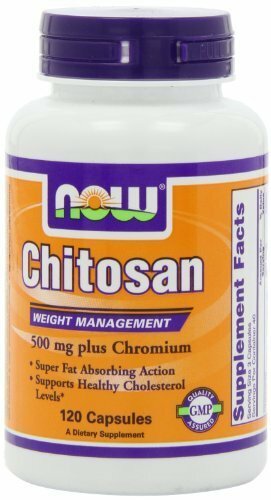 As mentioned above chitosan has mixed results with respect to weight-loss aid. Most of the studies confirm that chitosan only helps in weight-loss when combined with controlled calorie intake diet and exercise. But taking chitosan without cutting calories, doesn’t improve weight loss. Kindly refer the above section to learn more about its mode of actions. Chitosan is believed to be effective in kidney disease and kidney failure. In a small clinical trial 80 patients with kidney failure receiving ongoing hemodialysis treatment, half of the patients were given 1,500 mg of chitosan daily for 12 weeks and the other half did not receive any supplement. The data from this study showed a significant decrease in urea and creatinine levels. Although the exact mode of action is still unknown and requires more investigation. Chitin is the building material of which the outer shells of crustaceans (shellfish), insects, and the cell walls of certain fungi are made up of. Upon enzymatic or chemical deacetylation, chitin is converted to chitosan. Chitin has no known medical or industrial uses, Chitosan and its other derivatives, on the other hand, are well-known for their innumerable uses and applications. Chitosan is a long-chain polymer and difficult to digest. The most common side effects associated with chitosan supplementation are constipation, vomiting, cramping, and nausea. The higher the fats content in the diet, the worse these side effects are. Other instances reported overdosage of chitosan.